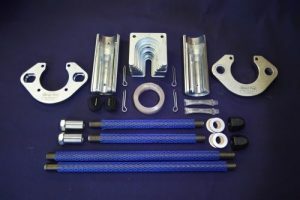 Every component that goes into a Strut-ProTM tool is of the finest quality obtainable. High tensile steel is the core of our tools. After forming, the yokes, horseshoes and collets are tumbled in ceramic media, then zinc plated for maximum protection. You get a product that has no burrs or sharp edges. A rich zinc coating impregnates into the metal; creating a plating far superior to paint or powder coating. Whether you are ordering a Complete Repair Yard Kit or a DIY tool assembly you get exactly the parts needed to do the job right. 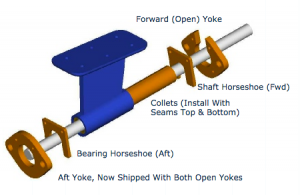 Now with two Open Yokes, Horseshoes in Incremental Sizes, Stackable High Tensile Steel Collets, Hook & Loop Straps, High Tensile Steel Horseshoes with Retainers, Shaft Sleeves, Shim Material for Off-sizes & Metrics. All parts are zinc plated. Two open yokes allow you to replace main and intermediate (forward) strut bearings without having to purchase an additional components.